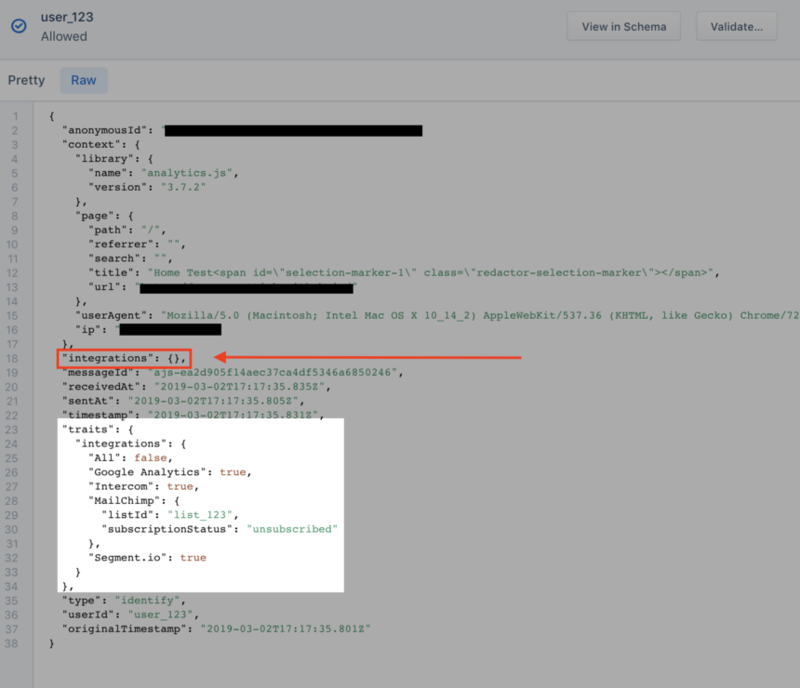 from my app, I can see the event in the segment debugger, but nothing happens in MailChimp. 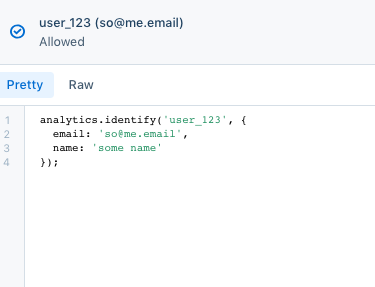 When, if I then click "Validate" next to that event in the debugger, it sends the request to MailChimp, which updates the subscriptionStatus accordingly. Why is it not updating automatically, and only when using "Validate" in segment's debugger? 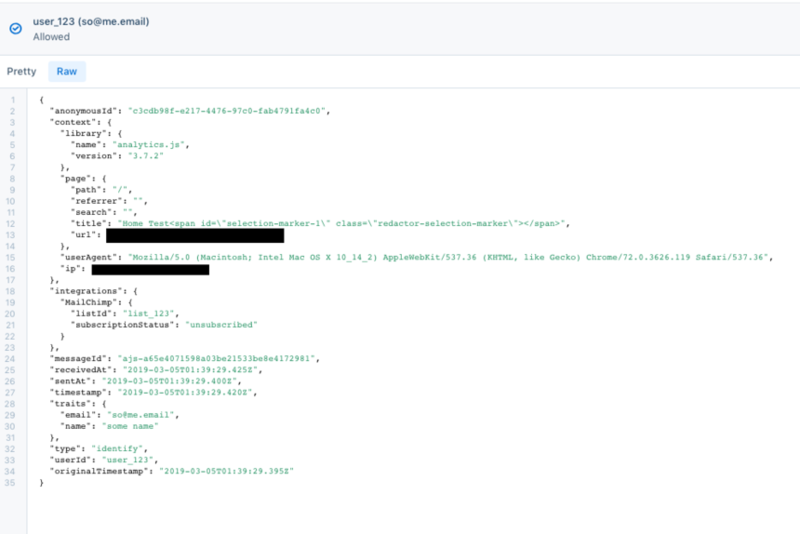 We can see in the JSON payload from the Segment debugger that the `integrations` object is incorrectly nested in the `traits` object and the true `integrations` object placeholder is left blank (see attached screenshot). All you'll need to do is to move that `integrations` object outside of the `traits` object. Hi Spencer Attick , thanks for getting back to me. Sorry I actually made a mistake in my previous message. "userAgent": "Mozilla/5.0 (X11; Linux x86_64) AppleWebKit/537.36 (KHTML, like Gecko) Chrome/69.0.3497.100 Safari/537.36"
Based on my renewed and more accurate information -- do you have any ideas? Thank you for that additional context! To confirm, is the problem still that this call doesn't go through to MailChimp unless you use the `Validate` feature in the Segment debugger? I wouldn't worry about the pretty view. It is meant to be an approximation of what you're likely sending to Segment in your call. It isn't perfect and doesn't have an impact on anything downstream. The raw view is the true payload Segment is receiving. If I send the call you shared, I get exactly the same results (see the screenshot below). That call also makes it through to MailChimp without me using the `Validate` feature (see screenshot below). It doesn't go all the way through because that `listId` doesn't exist in my MailChimp account, but it was sent. Are you able to see these events in your MailChimp Event Delivery view or do they not make it that far? It might be easier to reach out directly rather than using the Community Forum. If you'd like to do so, just create a ticket for our team using this form. They don't make it to the Events Delivery view, neither as Failed or Delivered. They do however make it all the way to MailChimp (which then performs the requested action), if I use the "Validate" function. Very curious indeed.